Master server (primary name server) – A master server stores the original master copies of all zone records. A hostmaster only make changes to master server zone records. Each slave server gets updates via special automatic updating mechanism of the DNS protocol. All slave servers maintain an identical copy of the master records. Slave server (secondary name server) – A slave server is exact replica of master server. It is used to share DNS server load and to improve DNS zone availability in case master server fails. It is recommend that you should at least have 2 slave servers and one master server for each domain name. How Do I View Authoritative Name Server Names and IP Address? 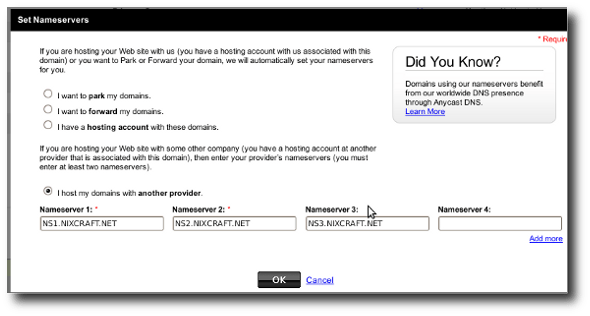 How Do I Register Authoritative Name Server? First, you need to register a domain name with your domain name registrar. Each domain name registrar allows you to set a primary name server (master server) and at least one secondary name server (slave server). For example, DNSKnowledge.com domain name is registered with GoDaddy domain name registrar. GoDaddy (or any other domain name registrar) allows you to change the DNS authoritative name server at the time of registration or later any time. What is Time To Live (TTL)? What Is Resolving Name Server? Thank you for a helpful tut… I knew about dig and nslookup, but not host with the -t flag. I just wanted to suggest not using GoDaddy any longer is your tuts… now that the owner has posted a video of himself proudly shooting and endangered animal, and elephant, in Africa I’m not using him any longer. In addition, he’s on record for violating some basic DNS rules to make money. So I don’t think we should use him any more. Yeah, I agree. Boycott GoDaddy! So true, Godaddy is scamming business ran by a douche psycho. Check out Web Host Pro or any decent company that is even better as a service. They lock domains and charge convenience fees for bogus reasons forcing you to pay them to release your domain. You’re a couple of idiots. Did you do any research, or did you just look at the pic circulating on FB? Try checking the facts. when nameservers are set at the domain registrar, do these settings go directly to the root name servers for .com ? How does domain registrar knows ip of name server? we only provide name server url to domain registrar. ns1.xyz.com how domain registrar of xyz.com knows on which ip dns server resides. could you please let me know Slave server and secondary DNS server both are same or not ??? i am little bit confused here. My client is an ISP. They want to put authoritative DNS server at their premises so that they can register domain names including reverse dns of their clients as their clients are facing reverse DNS issues while sending e-mail. Leave it to a couple of liberal morons to bring politics into a technical discussion. It used to be that people cared about learning and that shared knowledge transcended all boundaries no matter your feelings or opinions on religion, race, politics, gender persuasion, etc. But the two completely brain-dead and functionally retarded persons that are concerned about GoDaddy’s CEO killing an elephant just goes to show they will never seriously contribute to society in a meaningful way; let alone advancing technology. Next post: What Is NXDOMAIN (Non-Existent Domain)? Previous post: What Is TLD Name Server?